Three-time World Champion Ramy Ashour and current World No.3 Mohamed ElShorbagy - the man Ashour beat to win the 2012 and 2014 World titles in two of the greatest squash matches of all-time - could clash in a monumental third round encounter at the 2017 AJ Bell PSA World Championships after the official draws for the event were released today. The pinnacle event in the squash calendar, the World Championships bring together almost 200 of the world’s top male and female players, representing upwards of 30 nations, to contest the sought after title which, in 2017, will see the men and women compete for an equal prize purse for the first time in history – with the winners set to take home a record total in excess of $45,000 each. Buy tickets to the World Championships. Having won five of the last six events he has played, including back-to-back wins at the Qatar Classic and Hong Kong Open PSA World Series events this month, ElShorbagy will travel to Manchester as a firm favourite for the title where he will be hoping to make amends for his disappointing finishes in both the 2015 and 2016 edition of the tournament and finally add the sport's biggest title to his trophy cabinet. But the road to success will be fraught with dangers for the man who topped the World Rankings for 28 months until April 2017, as he will have to negotiate a tricky first round encounter with talented compatriot Mazen Hesham before a seeded third round clash with Ashour that could be one of the highlights of a blistering week of action. Should ElShorbagy come through that unscathed, home-hero Nick Matthew - who at 37 will be competing in his final World Championship and hoping for a repeat of the form that brought him the 2013 title when the tournament was last staged in Manchester - is seeded to await him in the quarter-finals, with the winner of that clash due to World No.1 Gregory Gaultier in the semi-finals. An added motivation for ElShorbagy will be the battle for the World No.1 spot, which he could reclaim if he makes it further than Gaultier in the showpiece event. On the opposite side of the draw, defending champion Karim Abdel Gawad will begin his tournament against Switzerland's dangerous Nicolas Mueller before a potential third round meeting with 2010 runner-up James Willstrop. Should Gawad come through that, he is seeded to meet Marwan ElShorbagy in the last eight. Meanwhile, U.S. Open winner Ali Farag, the 25-year-old who has developed a fascinating rivalry with ElShorbagy throughout 2017 - with the pair sharing the spoils in the finals of recent the U.S. Open and Hong Kong Opens - will begin his event against England's Adrian Waller before possible meetings with Ryan Cuskelly, Tarek Momen and Gawad or Marwan ElShorbagy to reach the finale. 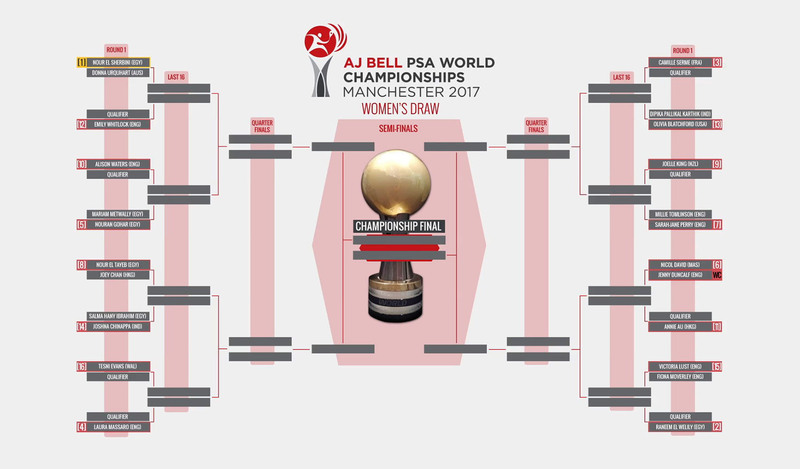 In the women's draw, defending champion Nour El Sherbini will be aiming to become just the fourth player of all-time alongside Nicol David, Sarah Fitz-Gerald and Michelle Martin to win three consecutive Women's World Championship titles and will begin her title defence against Australian Donna Urquhart. But the 22-year-old, who in 2015 became the youngest world champion in history, will have her work cut out to go all the way, with a seeded quarter-final match with compatriot Nouran Gohar likely to precede a semi-final clash with either Nour El Tayeb - the U.S. Open winner who comes into the event in the form of her life - or England's Laura Massaro, the 2013 champion, who will be hoping to replicate the form that saw her defeat El Sherbini en route to capturing the British Open crown in March. The bottom half of the draw will see two-time runner-up Raneem El Welily look to overcome the likes of David and Frenchwoman Camille Serme - the number three seed - to secure another appearance in the championship decider. 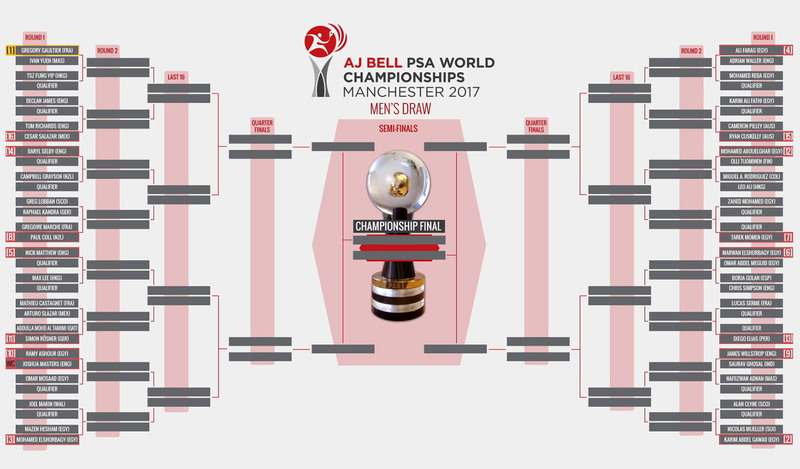 The 2017 AJ Bell PSA Men’s and Women’s World Championships will get underway at the National Squash Centre, Manchester between December 8-13 before the tournament moves to Manchester Central between December 14-17, 2017 for the quarter-final stages onwards.